As a little girl, I’d sit in my parents’ green lazyboy rocker and watch back-to-back episodes of Mister Rogers on our local PBS stations. He would say, “I like you just the way you are” as he looked right at me through that old television. And somewhere in my little four-year-old heart, I would simply and profoundly believe him. This belief has led me to this moment writing these words to you: Honey, you are enough, just the way you are. My adult self though knows that this can be hard for us to remember every day. It can get forgotten amidst the to-do lists and the moments when you think, “How did I get here?” And we can get overwhelmed by the roles we play and get lost in the daily routine. I want to help you come back to center, to knowing this truth, through accessible, manageable self-care and mindfulness practices that will help you cultivate a beautiful relationship with you. Registration for Being Seen, my ecourse about the mirror meditation and self-portraits, is open! I’m so excited to be offering it in this form one last time. This is a 5-week course that includes a journal sent to you in the mail, plus an optional care package upgrade full of goodies. This course is my offering to help you deepen your relationship with yourself while also creating a self-care and mindfulness practice you can do daily or whenever you most need it. Come along for 14 days of color adventures as we take back the gray days of February and fill them with color. Tell It: Color is your invitation to create space for creative play as you explore the stories waiting in the colors around and inside you. You'll choose the medium, and I'll provide prompts, inspiration, and space for connection. This is going to be a fun, easygoing class, and I'd love for you to come along. Registration is open! Find our more and register here. 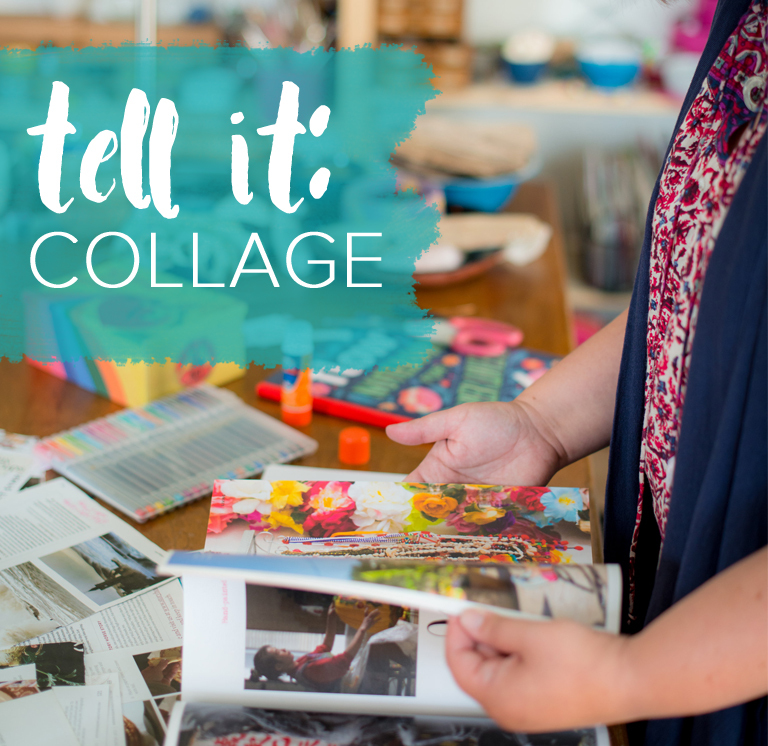 Come along and dive into the mediums of collaging + journaling (plus a big dose of inspiration and connection) to help you tell the stories waiting inside you. But this course is even more than that. And it connects you with a community of kindreds each finding their way to telling their stories every day. Come along for 21 days of creating and unearthing your stories. I am currently updating this course and it will be available again in Summer 2019. This is a gentle course that guides you through using your camera, journal writing, and self-care practices to reconnect with yourself. It is a 10-day journey into self-care, healing, and noticing what you need. You will come away with practices you can use again and again to fill up your own internal well so you can be more present to your loved ones and other things in your life. I am currently updating this course and it will be available again in Spring 2019. The blank page, the blinking cursor, the big white canvas, the camera in the corner. They sit there waiting.But in that empty space, an entire world awaits. A world that you (yes, you) create by simply picking up your pen, putting your fingers to the keyboard, grasping your paintbrush, bringing your camera up to your eye. There are stories to be told honey. Stories waiting inside you that are ready. And I want to help you tell them. Come along for 15 days of prompts and inspiration.